I've been using Tumblr for over 3 years now and in that space of time I have created (and deleted) 6 separate blogs with varying degrees of success. 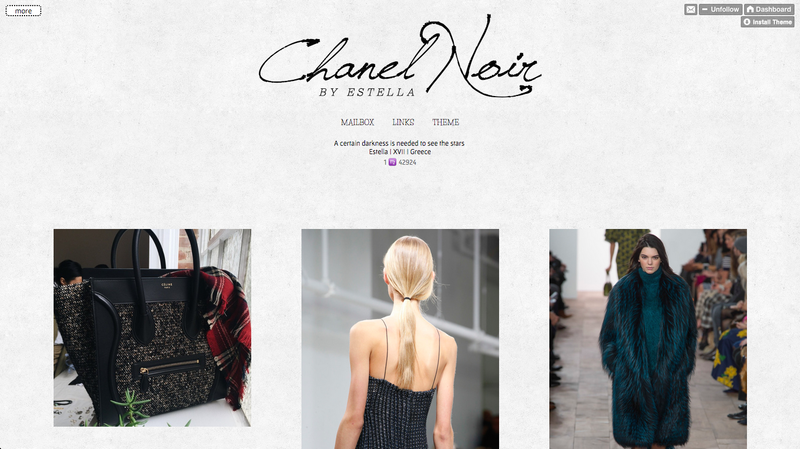 Without a doubt it is my favourite social media platform, so I'd thought I'd share some of my favourite fashion blogs on Tumblr. 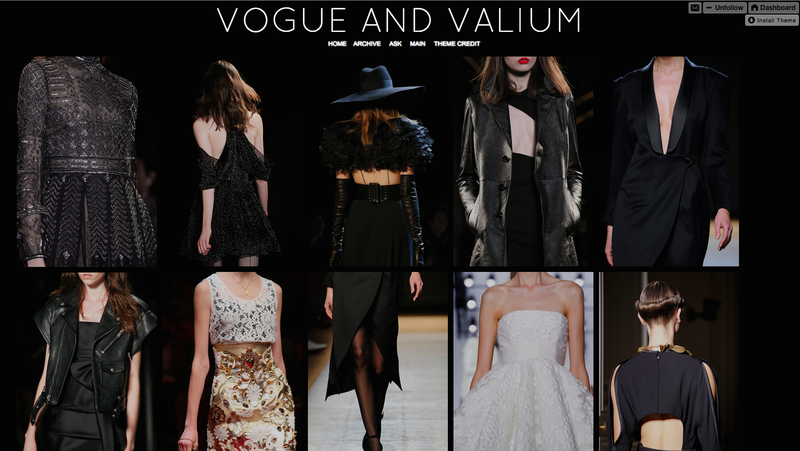 I probably reblog the most from Vogue and Valium because I love the selection of catwalk images. The style of the compiled images are mainly black and lots of textures are featured, for example leather and lace. 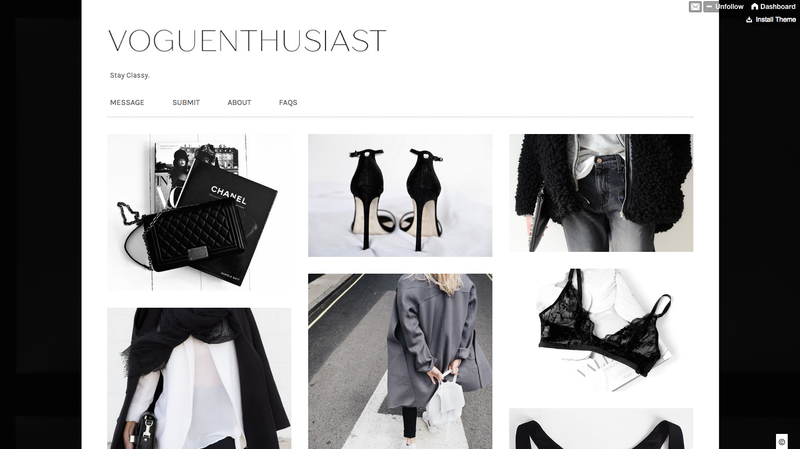 A gorgeous collection of monochrome street style, quotes, flat lays and beauty. Clean, beautiful and inspiring. The images in this theme are satisfyingly large, demonstrating the chic compilation of monochrome style and accessories. There is a focus on structured bags, designer labels and tailoring. This chic blog has a focus on metallics and textures, along with quotes and beautiful buildings. I feel that this blog focuses on the beautiful people that wear the clothes as well as the fashion itself. This appeals to me as I find people and beauty fascinating. I also enjoy the playlist. I also thought I'd show my current 3 Tumblr blogs, which may seem a little excessive, but they all serve a purpose and I love making blogs and reblogging inspiring images. First up is my personal blog, which is where I compile everything that I like. The URL is named after an unreleased song by Lana Del Rey, Go Go Dancer. At the moment my blog features a lot of neon artwork, Lana and fur. Glitter Binge/Glitter Gangsta is my blog dedicated to my obsession with glitter and sparkly things! I do take care to curate the images to my taste, as there are many sparkly pictures on Tumblr and it can be easy to reblog them all! Submissions are open for this blog, so if you'd like your work with glitter to be featured, please submit! Finally we have Girl From North London, a Tumblr page I created to accompany this blog. This page inspires looks and basically is an ongoing moodboard for my aspirational style. If you have a Tumblr blog, or admire someone else's, please comment below so I can check them out!